A standard American Checker Federation (ACF) set. Smooth red and white 1.25-inch (32 mm) pieces, green and buff 2-inch (51 mm) squares. 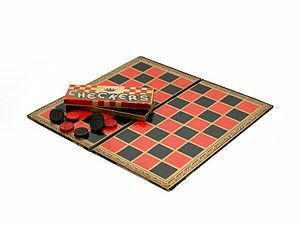 English draughts (British English) or checkers (American English and Canadian English), also called American checkers or Straight checkers, is a form of the strategy board game draughts. 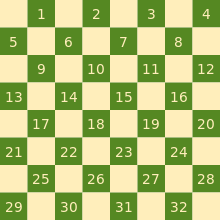 It is played on an 8x8 chequered board with twelve pieces per side. The pieces move and capture diagonally forward, until they reach the opposite end of the board, when they are crowned and may thereafter move and capture both backward and forward. 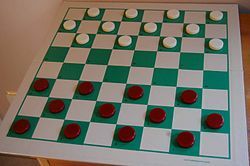 As in all forms of draughts, English draughts is played by two opponents, alternating turns on opposite sides of the gameboard. The pieces are traditionally black, red, or white. Enemy pieces are captured by jumping over them. Though pieces are traditionally made of wood, now many are made of plastic, though other materials may be used. Pieces are typically flat and cylindrical. They are invariably split into one darker and one lighter colour. Traditionally and in tournaments, these colours are white and red, but black and red are common in the United States, and light- and dark-stained wooden pieces are supplied with more expensive sets. There are two classes of pieces: men and kings. Kings are differentiated as consisting of two normal pieces of the same colour, stacked one on top of the other. Often indentations are added to the pieces to aid stacking. The starting position; Red moves first. Each player starts with twelve pieces on the dark squares of the three rows closest to that player's side (see diagram). The row closest to each player is called the kings row (or crownhead). The player with the darker-coloured pieces moves first. A jump is a move from a square diagonally adjacent to an opponent's piece to an empty square immediately beyond it, in the same direction. (Thus jumping over the square containing the opponent's piece.) Uncrowned pieces may jump only diagonally forward; kings may jump in any diagonal direction. A jumped piece is considered "captured" and removed from the game. Any piece, whether crowned or not, may jump a king. Multiple jumps are possible, if after one jump, another piece is immediately eligible to be jumped - even if that jump is in a different diagonal direction. If more than one multiple-jump move is available, the player may choose which piece to jump with, and which sequence of jumps to make. The jumping sequence chosen is not required to be the one that maximizes the number of jumps in the turn; however, a player must make all available jumps in the sequence chosen. If a player's piece moves into the kings row on the opponent's side of the board, that piece is said to be crowned (or often kinged in the U.S.), becoming a king and gaining the ability to move both forward and backward. If a player's piece jumps into the kings row, the current move terminates; the piece cannot continue on by jumping back out (as in a multiple jump), until the next move. A piece is normally crowned by placing a second piece on top of it; some sets have pieces with a crown molded, engraved or painted on one side, allowing the player to simply turn the piece over or to place the crown-side up on the crowned piece, further differentiating kings from ordinary men. In tournament English draughts, a variation called three-move restriction is preferred. The first three moves are drawn at random from a set of accepted openings. Two games are played with the chosen opening, each player having a turn at either side. This tends to reduce the number of draws and can make for more exciting matches. Three-move restriction has been played in the United States championship since 1934. A two-move restriction was used from 1900 until 1934 in the United States and in the British Isles until the 1950s. Before 1900, championships were played without restriction: this style is called go-as-you-please (GAYP). One rule of long standing that has fallen out of favour is the huffing rule. In this variation jumping is not mandatory, but if a player does not take their jump (either deliberately or by failing to see it), the piece that could have made the jump is blown or huffed, i.e. removed from the board. After huffing the offending piece, the opponent then takes their turn as normal. Huffing has been abolished by both the American Checker Federation (ACF) and the English Draughts Association. A piece which in the current move has become a king can then in the same move go on to capture other pieces. For recording games, there is a standardised notation. All 32 reachable positions of the board are numbered in sequence. The numbering starts in Black's double-corner. Black's squares on the first rank are numbered 1 to 4. The next rank starts 5 to 8, and so on. Moves are recorded as "from-to", so a move from 9 to 14 would be recorded 9-14. Captures are notated with an "x" connecting the start and end square. The game result is often abbreviated as BW/RW (Black/Red wins) or WW (White wins). Squares are identified by numbers 1-32. In draughts diagrams, the Black side is typically shown at the top. In printed diagrams, dark and light squares are often reversed for legibility. White resigned after Blacks 46th move. World Championship in English draughts as the men's version dates to the 1840s it predates the men's Draughts World Championship, the championship for men in International draughts, by several decades. Noted world champions include Andrew Anderson James Wyllie, Robert Martins, Robert D. Yates, James Ferrie, Alfred Jordan, Newell W. Banks, Robert Stewart, Asa Long, Walter Hellman, Marion Tinsley, Derek Oldbury, Ron King, Michele Borghetti, Alex Moiseyev, Patricia Breen, and Amangul Durdyyeva. Championship held in GAYP (Go As You Please) and 3-Move versions. The winners in men's have been from the United Kingdom, United States, Barbados, and most recently Italy in the 3-Move division. The woman's championship is more recent and started in 1993, the winners have been from Ireland, Turkmenistan, and the Ukraine. Since 2013 held European Cup, since 2015 World Cup. The first English draughts computer program was written by Christopher Strachey, M.A. at the National Physical Laboratory, London. Strachey finished the programme, written in his spare time, in February 1951. It ran for the first time on NPL's Pilot ACE on 30 July 1951. He soon modified the programme to run on the Manchester Mark 1. The second computer program was written in 1956 by Arthur Samuel, a researcher from IBM. Other than it being one of the most complicated game playing programs written at the time, it is also well known for being one of the first adaptive programs. It learned by playing games against modified versions of itself, with the victorious versions surviving. Samuel's program was far from mastering the game, although one win against a blind checkers master gave the general public the impression that it was very good. In the 1990s, the strongest program was Chinook, written in 1989 by a team from the University of Alberta led by Jonathan Schaeffer. Marion Tinsley, world champion from 1955-62 and from 1975-91, won a match against the machine in 1992. In 1994, Tinsley had to resign in the middle of an even match for health reasons; he died shortly thereafter. In 1995, Chinook defended its man-machine title against Don Lafferty in a thirty-two game match. The final score was 1-0 with 31 draws for Chinook over Don Lafferty. In 1996 Chinook won in the USA National Tournament by the widest margin ever, and was retired from play after that event. The man-machine title has not been contested since. In July 2007, in an article published in Science magazine, Chinook's developers announced that the program had been improved to the point where it could not lose a game. If no mistakes were made by either player, the game would always end in a draw. After eighteen years, they have computationally proven a weak solution to the game of Checkers. Using between two hundred desktop computers at the peak of the project and around fifty later on, the team made just 1014 calculations to search from the initial position to a database of positions with at most ten pieces. The number of legal positions in English draughts is estimated to be 1020, and it has a game-tree complexity of approximately 1040. By comparison, chess is estimated to have between 1043 and 1050 legal positions. When draughts is generalized so that it can be played on an n-by-n board, the problem of determining if the first player has a win in a given position is EXPTIME-complete. The July 2007 announcement by Chinook's team stating that the game had been solved must be understood in the sense that, with perfect play on both sides, the game will always finish with a draw. Yet, not all positions that could result from imperfect play have been analyzed.